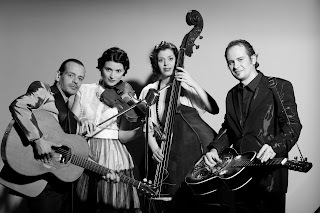 Lilly of the West had a successful summer season, including appearances at two major festivals: La Roche Bluegrass Festival, France, and the Bansko Jazz Fest, Bulgaria. The band also played a series of concerts in the Sofia parks, organized by the municipality. Dorian Ricaux, a young, talented French mandolin player collaborated with Lilly of the West on several occasions. He was invited to join the band because of Lilly’s hand injury. She has been suffering from a 'trigger finger' in the past two months. In October the problem will hopefully be relieved by a small surgery. In September the band tours in Bulgaria and abroad: Lovech Bard fest 2/3.09, Asenovgrad, Plovdiv 16/17.09, as well as in Hungary, Slovakia, and Austria (see below). Recordings for the new album have been in process. It will feature jazz and swing standards, covers of Hank Williams, Patsy Cline, Everly Brothers, two Bulgarian folk songs, and Lilly’s original compositions.